The Vice President of India Shri M. Venkaiah Naidu has called for promoting Zero-Budgeting in natural farming to make farming viable and sustainable. The Vice President has also called for innovative solutions to make farming profitable and the scaling up of such solutions. Shri Naidu made these statements as part of a National Consultation towards doubling farmers’ incomes and making agriculture profitable and sustainable. Also present during the National Consultation were the Governor of Himachal Pradesh Acharya Devvrat, Agricultural expert Shri Subhash Palekar and the Advisor (Agriculture) to Government of Andhra Pradesh Shri Vijay Kumar. Shri Acharya Devvrat briefed the Vice President on the best agri-practices adopted in Himachal Pradesh to improve the income of farmers. 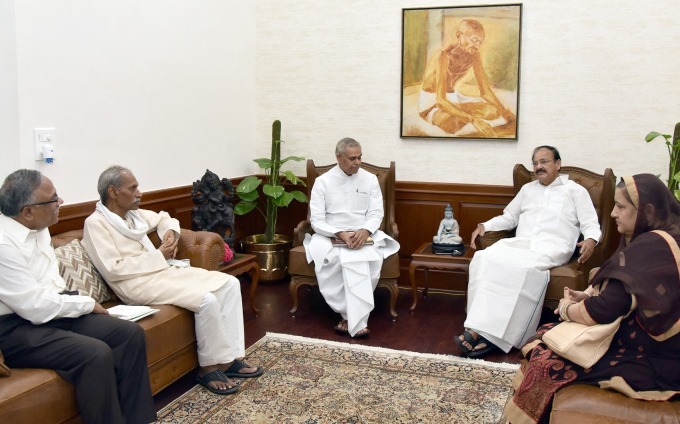 Shri Subhash Palekar and Shri Vijay Kumar briefed the Vice President on the role of Zero-budget farming in bringing down the input costs and in promoting natural farming. The Vice President held extensive discussions on various issues relating to agriculture and also shared the outcomes of National Consultation on Agriculture held in Pune, Maharashtra recently. He informed that a series of National Consultations were being held across to seek realistic solutions to make agriculture sustainable and profitable. The Vice President also informed that unlike in the past, the farmers today are facing the problem of plenty and there is a need to streamline the procurement methods. Expressing his concern over increasing input costs and the lack of remunerative prices to farmers, he complimented the Union Government for steeply increasing the MSP for paddy and other kharif crops. During the interaction, the Vice President complimented the Himachal Pradesh Government for promoting natural farming. He said that other States should emulate Himachal Pradesh as part of mitigating agrarian crisis. According to the Vice President, farming should be climate-resilient in the wake of increasing problems due to climate change. Referring to the exorbitant cost of fertilizers and pesticides, he advised the state governments to introduce farmer-friendly policies. Top image: Vice President Shri M. Venkaiah Naidu interacting with the Governor of Himachal Pradesh Acharya Devvrat and other Agricultural Experts on making agriculture profitable and sustainable in New Delhi on July 10, 2018. DG Correspondent, thanks a lot for the article post.Much thanks again. Fantastic.